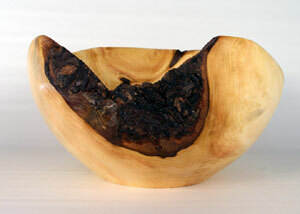 This burl bowl was a challenge to turn as the top was anything but even. It is rather thick so that I could save some of the bark. It has some nice figure near the bottom right. Not a burls have the great figure but mother nature does her best. This one is 10″ by 5 1/2″. It is one of two that came from a larger burl. This piece will go to the family that gave me the burl. I am working on the other half but it will take me a while to complete it.